For some producers, a combination of events this spring has lead to an over abundance of grass in pastures. Adequate rainfall, ideal temperatures, and plenty of sunshine lead to grasses growing too tall and too quickly for cattle to graze. Sounds great, right? Think again. When cattle were turned out onto these pastures, much of the grass was trampled rather than consumed. 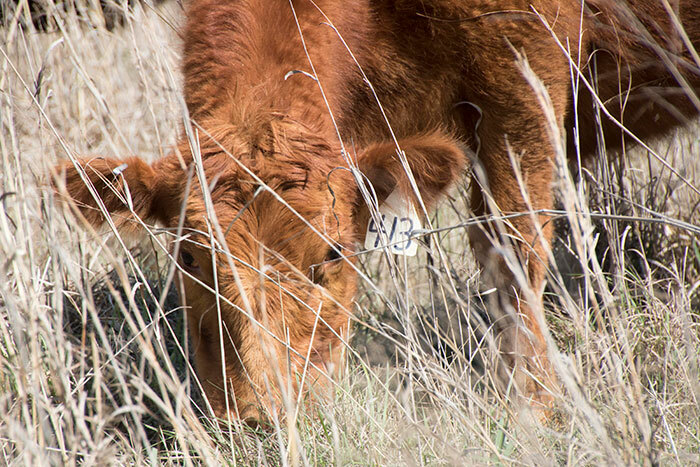 Bruce Anderson, extension forage specialist at the University of Nebraska-Lincoln (UNL), explains why this happened and some viable options to mitigate this dilemma in the UNL BeefWatch newsletter. “As we come back to graze those pastures a second time, there is a combination of new growth, tall stemmy grass, dead and brown trampled grass, and partly pushed over but still green old grass,” Anderson explains. Animals that are allowed to graze in these pastures with plenty of time and space to wander around will just consume the regrowth. They will then proceed to make it known that they want fresh pasture by bellowing. One option, if plenty of pasture is available, is to give in to their demands and move them to a fresh pasture. Anderson identifies raising the stocking density as another option. “In other words, only give the herd part of the pasture at a time,” he clarifies. While this option does require some effort setting up temporary fencing and managing water access, Anderson assures that it can be well worth it. If stocking density is elevated so animals have access to approximately one day’s worth of grazing at a time, grazing and manure distribution will be more uniform. Animals will also eat more of the older and less desirable forage, which will raise the carrying capacity. Previously trampled grass will also get incorporated into the soil for faster recycling of nutrients and improvement in soil health. No matter which option is chosen, putting extra effort into grazing will help extend grazing and improve conditions for future grazing. Kassidy Buse was the 2018 Hay & Forage Grower summer editorial intern. She is from Bridgewater, S.D., and recently graduated from Iowa State University with a degree in animal science. Buse will be attending the University of Nebraska-Lincoln to pursue a master’s degree in ruminant nutrition this fall.